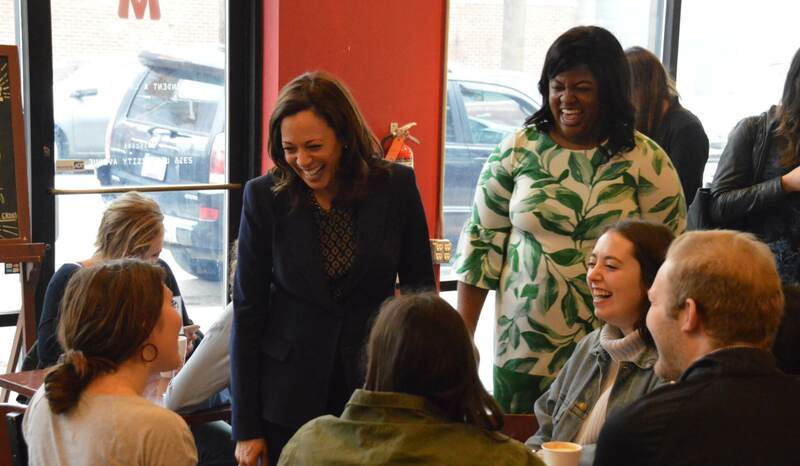 Senator Kamala Harris is running for president, but an event of hers in Des Moines yesterday was focused on other candidates – women running or thinking of running for local offices. She spoke with a group of about 125 women at an Emerge Iowa house party, where she acknowledged the many barriers women run into when considering a run. “It’s not your turn, it’s not your time, no one like you has done this before, it will be too hard and difficult to do,” Harris said of what they’ll often hear. Don’t let that discourage you, Harris urged. “I like to say, I eat ‘no’ for breakfast,” she added. Harris was on hand at the house of Liz and David Adelman to address Emerge Iowa, an organization formed here last year to help train and support women running for office. It’s an affiliate of a larger national group that has trained 4,000 women since 2002, has 475 alums serving in office, and helped 560 women on the ballot in 2018. It’s also an organization that actually grew out of Harris’ first campaign. Andrea Dew Steele, a friend of Harris, helped the now-Senator plan out her first run for San Francisco District Attorney back in 2002. Inspired by that effort, and realizing that women often lacked information and training on how to get involved in the political process, Dew Steele started Emerge California, which eventually led to chapters all over the country. Harris shared some of the lessons she learned from her campaigns, as well as the challenges and opportunities that female candidates have when running. She noted that only got taken seriously in her first race for District Attorney, where she was running against an incumbent, when she put up large fundraising numbers. Harris also pointed to several natural strengths that women have in politics. One story that Harris shared of her tactics in her first race amused the group. Harris explained that she would take her ironing board with her to campaign outside out of grocery stores because it made for an easy table that she could set up signs and literature on. And Harris spoke about the people in her life who helped motivate her for a life of public service. “My mother was the kind of person who if you ever came home complaining about a problem, the first thing she’d do is she’d look at you, and say, ‘Okay, what are you going to do about it?’ So, I decided to run for President of the United States,” Harris said. This was part of Harris’ third trip to Iowa since announcing her presidential run. She also visited Iowa City for a large town hall on Wednesday evening and dropped by Mars Cafe, where she ran into Drake University’s Griff the Bulldog mascot and also some students.